Jockey Edgar Prado dedicates his win aboard Round Pond to his late mother. The $2 million Emirates Airline Breeders' Cup Distaff (G1) features the best older fillies and mares going 1 1/8 miles on the main track, deciding the titles of champion older female and champion 3-year-old filly. A maximum field of fourteen went to the starting gate but unfortunately, only twelve completed the trip. 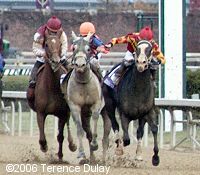 The field was well-matched, with Fleet Indian sent off as the 5-2 favorite off her undefeated season so far, including the Delaware Handicap, the Personal Ensign, and then the Beldame in her final prep. 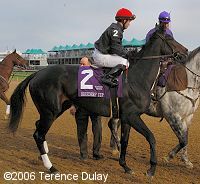 The 3-1 second choice was Pine Island from the powerful Phipps Stable, winner of the Gazelle and the Alabama, with 9-1 Balletto, who was second to Fleet Indian in her last 2 starts, was the third choice. Asi Siempre pushes between Happy Ticket and Balletto in the stretch, bumping Balletto. This incident led to her disqualification from second to fourth, behind Balletto. 16-1 Healthy Addiction was quickest out of the gate and led the field past the stands and around the clubhouse turn through a quarter in 22.91 and a half in 46.75 while being challenged by 39-1 Sharp Lisa and 12-1 Pool Land. Entering the backstretch, Pine Island, who was twelfth at the time, broke down and fell, throwing jockey Javier Castellano to the track. Pool Land took over the lead at the end of the backstretch after 3/4 in 1:11.59, but the quick pace set the race up for the closers. 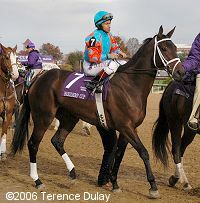 14-1 Round Pond, who was sixth early, found running room along the inside under the controls of jockey Edgar Prado and made her move toward the leaders, while favorite Fleet Indian, who had raced in midpack eighth, took a bad step and was pulled up at the 1/4 pole by jockey Jose Santos. Through the stretch, Round Pond took the lead and pulled away to a 4 1/4 length win over late-running Asi Siempre in a time of 1:50.50. It was just 1/2 a length back to 15-1 Happy Ticket in third, and a length more to late-running Balletto in fourth. Because the stewards found that Asi Siempre interfered with Balletto in mid-stretch, they disqualified her from 2nd to 4th, moving Happy Ticket to 2nd and Balletto up to 3rd. Round Pond wins by 4 1/4 lengths at 13-1 in the Distaff. 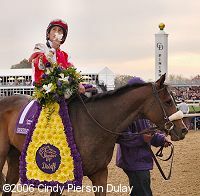 Round Pond with her Breeders' Cup flowers. Winning trainer Michael Matz said, "She went into this race better than any race I've had her. The Molly Pitcher (her first race for Matz) was my fault, I made the call the to put regular shoes on her, and I should have kept the glue-on shoes on her. It was my fault and she paid the price. We've corrected that situation since then. She has trained well since. She's a very, very nice filly with a huge heart. She's a real winner and a real champion." Round Pond strikes a pose as her winner's blanket is put on her. Winning jockey Edgar Prado said, "I got a beautiful trip. I was able to sit in behind the speed. She was a little anxious, especially on the turns, but she settled in nicely and ran very hard to win." Second place finisher Happy Ticket in the post parade. She was moved up to second after the disqualification of Asi Siempre and with the earnings from this race is now the richest Louisiana-bred of all time. 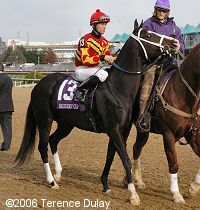 Her jockey Garrett Gomez said, "My trip was OK but my filly never really got a hold of the racetrack. I asked her for her best, she tried, but she was really struggling. 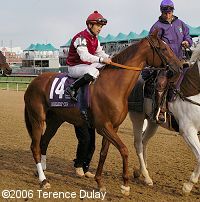 She was never comfortable anywhere on the racetrack, but she still ran third against some very nice fillies." Third place finisher Balletto in the post parade. Her jockey Corey Nakatani said, "She was doing good, but the horse next to me came out and knocked her off stride real hard. I was never able to get her going again." Favorite Fleet Indian in the post parade. She suffered a suspensory ligament injury in her left front leg and had to be pulled up. Veterinarian Dr. Wayne McIlwraith said, "After being taken back to the barn and radiographed, there were no fractures. There is an injury to both suspensory branches, which is causing a little bit of dropping of the fetlock joint, but she'll be able to be treated effectively and be fine as a broodmare." Jockey Jose Santos added, "She did it (sustained injury) along the 1/2 mile pole, and I decided to take a hold, and take good care of her. She's more valuable as a broodmare. It was her life, my life, and everybody's life behind her." She was scheduled to be sold at the Keeneland auction on Monday, but has been withdrawn now. Pine Island in the post parade before the race. She broke down going into the backstretch and had a compound fracture of her left front leg. Sadly, Pine Island had to be euthanized due to the extent of her injuries. Attending veterinarian Dr. Wayne McIlwraith said, "Pine Island sustained a dislocation of the left front fetlock joint. The injury was open, and because of the combination of it being open and the instability, she has been euthanized." 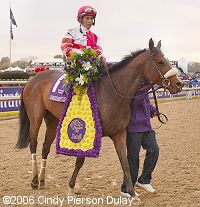 Her jockey Javier Castellano was uninjured and was able to ride Bernardini in the Classic. He said, "She was where she usually is (off the pace). She was running good. We got on the backside, and I asked her to switch leads, and it happened so fast. She broke down. I don't know what else to say."